Abstract. Here we show results from Earth system model simulations from the marine cloud brightening experiment G4cdnc of the Geoengineering Model Intercomparison Project (GeoMIP). The nine contributing models prescribe a 50 % increase in the cloud droplet number concentration (CDNC) of low clouds over the global oceans in an experiment dubbed G4cdnc, with the purpose of counteracting the radiative forcing due to anthropogenic greenhouse gases under the RCP4.5 scenario. The model ensemble median effective radiative forcing (ERF) amounts to −1.9 W m−2, with a substantial inter-model spread of −0.6 to −2.5 W m−2. The large spread is partly related to the considerable differences in clouds and their representation between the models, with an underestimation of low clouds in several of the models. 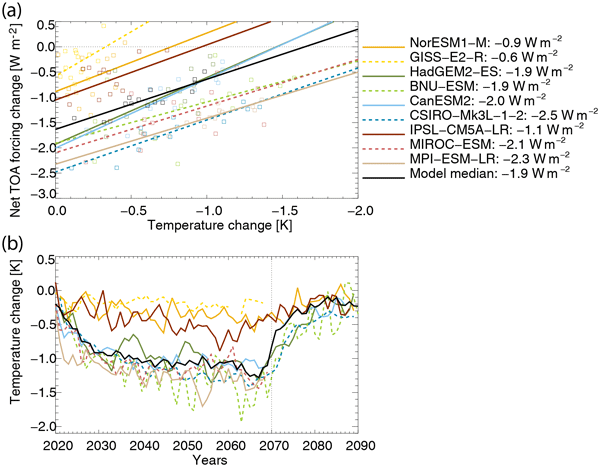 All models predict a statistically significant temperature decrease with a median of (for years 2020–2069) −0.96 [−0.17 to −1.21] K relative to the RCP4.5 scenario, with particularly strong cooling over low-latitude continents. Globally averaged there is a weak but significant precipitation decrease of −2.35 [−0.57 to −2.96] % due to a colder climate, but at low latitudes there is a 1.19 % increase over land. This increase is part of a circulation change where a strong negative top-of-atmosphere (TOA) shortwave forcing over subtropical oceans, caused by increased albedo associated with the increasing CDNC, is compensated for by rising motion and positive TOA longwave signals over adjacent land regions. How to cite: Stjern, C. W., Muri, H., Ahlm, L., Boucher, O., Cole, J. N. S., Ji, D., Jones, A., Haywood, J., Kravitz, B., Lenton, A., Moore, J. C., Niemeier, U., Phipps, S. J., Schmidt, H., Watanabe, S., and Kristjánsson, J. E.: Response to marine cloud brightening in a multi-model ensemble, Atmos. Chem. Phys., 18, 621-634, https://doi.org/10.5194/acp-18-621-2018, 2018. Marine cloud brightening (MCB) has been proposed to help limit global warming. We present here the first multi-model assessment of idealized MCB simulations from the Geoengineering Model Intercomparison Project. 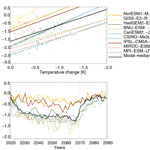 While all models predict a global cooling as intended, there is considerable spread between the models both in terms of radiative forcing and the climate response, largely linked to the substantial differences in the models' representation of clouds.